Degree of Skill: Advanced. Exceptional pewter and tin abilities. Very skilled, but not uncommonly so, in steel pushing and Iron pulling. Instictive adeptness in bronze. Useless with the other mental metals. Hair: Shoulder length, thin, silky, straight Black. Overall Appearance: Viridian is a remarkably pretty young woman, though while she is often one of the more beautiful women in the room she is rarely the most enchanting. She has long, slender facial features, and evenly proportioned bone structure. What little she lacks in terms of classic beauty she has recovered in physical prowess. Viridian has an athlete?s body. She is toned to perfection, and carefully tanned to hide what would otherwise be a sickly pale exterior. She is missing her pinky and ring finger on her left hand, as well as her left ear, which she hides beneath her hair. Special Skills: Viridian is an avid reader, her mother has insisted on occasion that she take upon herself more feminine hobbies, however she is more apt to be found practicing more physical activities. She?s an excellent swimmer, she ?enjoys? running, and otherwise all aspects of track and field. She is also very acrobatic. She trains without the use of Allomancy, to later employ what she has learned out among the Mists. Strengths: Viridian is a physical powerhouse. She employs pewter, tin, steel and iron in ways few others can. Her physical training exercises hold a double purpose, both to strengthen her body and to increase what she may accomplish with Allomancy. Unlike traditional Thugs, Viridian employs her pewter as much to flip, twist and tumble as she uses it to throw a punch. She never ceases to burn tin. Additionally she is intimately versed in the strengths and weaknesses of both the steel push and iron pull. She is expert as well in bronze, though it is an instinctual affinity, not trained. Her emotional state alone would immediately inform her of even the most subtle attempt to pull at her emotions, when burning brass, she immediately knows what is being manipulated. That being said, she is unlikely to accuse the soothers and rioters. Occasionally she finds their meddling refreshing. Weaknesses: As great as her prowess may be with the Physical metals, Viridian suffers an almost autistic inability to properly use the mental metals. They are there, she can burn them and she can, attempt, to alter the emotional state of others, but her subtlety is nonexistent, as is her ability to understand or contemplate what she might possibly wish another to feel. In this way, she is almost incapable of manipulating another with Allomancy. She also has little need to employ copper, and so has little practice in the metal aside from the urge to burn it. Viridian Demesne is, in many aspects, a sociopath. She rarely feels strongly about anything. She tends to behave both stoically confidant, and viciously cold. Most insults bounce off of her as though paper against steel, while alternately she might offer an observation that is unintentionally cutting or cruel. She has a deep psychological addiction to the Allomantic metals. She does not hide that she is an Allomancer, going so far even as to wear her vials on her person in place of jewelry, and has a tendency to arrive late to Ball?s in clothing that intentionally reveals her midriff. While most see her temperament, perhaps, as a means by which to annoy her family and the families of others as well as a morally reprehensible attitude, the truth is far more disturbing. For Viridian, everyday life is both a struggle for survival as well as an emotional experiment. Every action she takes, be it to offer a Skaa beggar several extra boxings to poisoning her brother to death are frustrated yearnings to experience a deep emotional attachment she has yet to attain. For this reason she is as unpredictable as she is stoically calm. Viridian Demesne is quite literally, capable of anything. Viridian was born to the lesser House Demesne the second child of two. Her mother and father loved her, as did her older brother and Heir to the house. For four years she lived a proper young lady?s life. She laughed, giggled and played like any noble child, she hugged her parents, she enjoyed friends and socializing with others. Her Father was always busy, between business and making bids for a Great House, but always made time for her, while her mother doted upon her baby girl, and the last child she would ever bear due to complications at Viridian?s birth. All of this, however, would be a fleeting era in Viridian?s life, one she would often look back on with longing. Viridian?s life, as she knew it, was stolen from her quite literally, by a Luthadel based thieving crew one morning whiles she played in the grass outside her fathers manor. Masking themselves as plantation skaa, the thieves infiltrated the Manor, found the girl, and kidnapped her, holding her for a ransom they would never receive. Viridian was seven, and could hardly believe what had happened to her. She had protested her captivity, professed her position, demanding release, but to no success. Her demands and arrogance only served to annoy the thieves, who grew steadily more and more desperate for the ransom money to arrive. In this time, Viridian?s family worked diligently with Obligators and Inquisitors alike to locate Viridian and punish the Skaa for their impossible scheme, one did not bargain with Skaa after all. In their growing desperation, the thieving crew began returning pieces of Viridian to the Demesne Manor in the hopes of facilitating cooperation. First they sent the Pinky finger of Viridian?s left hand, followed a week later by the ring finger of the same appendage. When this failed, the crew moved toward more extreme measures, cutting Viridian?s left ear free and sending it as well. As the weeks turned to months and the Inquisitors closed in on their location, the Thieving crew provided the Demesne manor with proof of Viridian?s broken virginity, but were given no further chance to mutilate the girl. The Inquisitors found the thieving crew and only just managed to save Viridian before the crew slit her throat in retaliation. During her time in captivity, Viridian?s Allomantic powers had snapped, this was noticed by one of the Inquisitors who, upon returning Viridian to her parents, informed them of their ?substantial good fortune?. House Demesne was happy to have their child back, though it had taken two years to find her, and in this time, Viridian had changed. Where once she had laughed and giggled, she had become a near silent catatonic. She avoided contact with her old friends, and for all the world appeared to be closing herself off from the outside world. Her parents, fearful for her sanity, found an man to train her in the use of Allomancy, and were given a marvel. Her trainer, a man from the Ministry? or not, his past was as secretive as he, came to Viridian?s rescue like a white knight. His training gently pulled the changed Viridian free of her shell, returning her senses to the outside world and revealing to her the freedom and power associated with becoming a Mistborn. Upon completion of her training however, deeper scars would not relent, and new afflictions presented themselves. Free?d of her near autistic depression, Viridian had grown into an oddity of a girl. She pushed herself mercilessly, and yet never accepted assistance. She began insisting that she have Allomantic metal in her at all times, and in the cases of tin and copper, burning at all times. Despite having no precedence as a drug, Viridian found herself addicted to the vials of metal. Addicted on a psychological level with the powerful exhilaration of ?Mist walking? as she likes to call it. 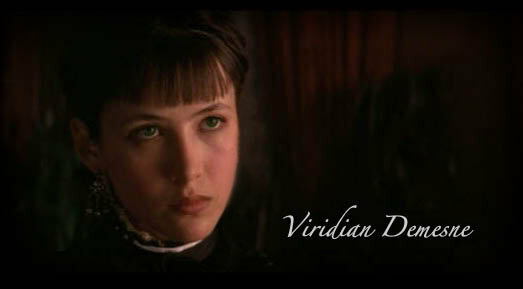 Viridian had aquired a psychopathic tendency to ignore feelings and emotions. She had trouble feeling happy or sad, resentful or joyful, and these shortcomings alone trouble her and thus began her great experiment. Her brother died of illness when she was 17, she felt nothing. She was elevated to the Heiress of her house as there would be no other, she felt nothing. As life passed her by, Viridian began to identify problems with herself physically and immediately set out perfecting those inadequacies hoping to instill some sense of self esteem, she felts nothing, but has not halted the practice. She has identified the primary symptoms of her condition, however, to the present, has failed every attempt in her great experiment to fix her broken psyche. Every day she grows more desperate. Viridian burned gold. As had become a near obsession, she watched herself, observed the subtleties, the small differences that meant anything and everything. The extra fingers on her left hand, her hair pulled back, unashamed of the ear that had not been cut from her body. Head high, a smile on her features, a smile that stretched beyond her mouth? a smile that read true in her eyes? There were similarities as well, Viridian stood her full height, she stood proud, competent, collected, unafraid, and all these things she saw reflected in the woman she could have been, in the woman she was obsessed with. Her eyes were just as green as her own. She stood just as tall, though she was more fragile in appearance. Viridian could see the physical inadequacies in herself that had been perfected? and yet she did not feel this a victory. As always, she looked back at herself with that smile that reached her eyes. To Viridian it said, ?I?m still winning. You may be stronger and faster, you may be an Allomancer nearly without pear? but I?m happy. Your not.? The gold burned out. The other Viridian shimmered and disappeared from her view, and she waited. It would come, it always did, it was why she burned gold after all. Tears welled up in her eyes, she clenched her fist angrily, gritted her teeth and with a snarl of blissful rage, she threw the remaining gold earring at the Mirror with pewter enhanced viciousness, shattering the reflective surface in the far corner of the room, least she attempt to look at herself. Instead she closed her eyes enjoying that fleeting moment of anger, jealousy and hatred she always felt after watching herself. It was the only way Viridian could force an emotional response, the only way she had discovered anyway. Somehow she felt there was a solution in that. Perhaps the anger she now felt toward the other her could help her find the answer. Perhaps this hatred could teach her how to rekindle everything else? or perhaps she ought to give up this piece of the experiment once and for all? but no. She felt to little. Anything, even this? this malicious rage, was better than nothing at all. As always, the feeling passed, to quickly. Anger seemed to burn fast? perhaps emotions were like the metals that way. She thought that she could remember being happy. She thought that joy and good feelings had burned slowly? she shook her head with a longing sigh. Stepping from her room to resume her training regimen . She had divulged from her daily routines for to long. Pulling free one of the three vials against her necklace, she gulped down the Allomantic cocktail, least the shaking begin, and she made her toward the pool. Okay, you got all the typos out, so you're good to go.